Located at 14400 Randall Avenue in Fontana — near the San Bernardino Freeway and across the street from the Auto Club Speedway of California — the new $30 million full-service dealership is well-positioned to serve long-haul customers traveling through southern California. The largest Mack dealership in North America recently opened in Fontana, Calif., the newest location in Portland, Ore.–based TEC Equipment's network of 26 dealerships in the western region. Located at 14400 Randall Ave. in Fontana — near the San Bernardino Freeway and across the street from the Auto Club Speedway of California — the new $30 million full-service dealership is well-positioned to serve long-haul customers traveling through southern California. The 174,000-sq. ft. facility houses a full-service dealership with shop capacity to service up to 102 trucks and a 2.2-acre parts warehouse that stocks $5.5 million in parts inventory, with an additional 40,000 sq. ft. of mezzanine space available. Customers will find a complete suite of services at the dealership, with teams handling new truck sales, financing and insurance for Mack trucks. 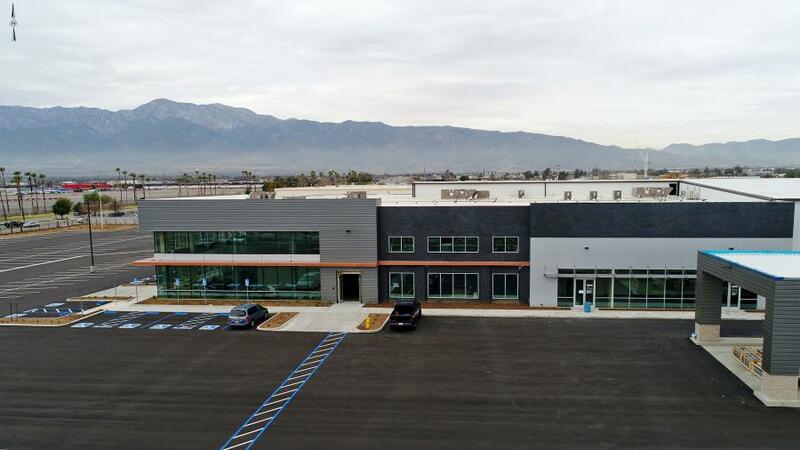 “TEC Equipment's new flagship facility in Fontana significantly expands our ability to provide Mack customers in the western region with best-in-class sales, service and support,” said Jonathan Randall, senior vice president of sales and marketing of Mack Trucks North America. The Fontana dealership is the newest of more than 430 Mack Trucks dealer locations in North America. Since 2010, Mack dealers have invested more than $680 million in facilities, resulting in a 55 percent increase in service bay capacity, 124 percent more technicians, a more than a 65 percent increase in service capacity and over 248 percent more master technicians. TEC Equipment Director of Business Development David O. Thompson said that this new facility, five years in the making, will provide the technology, the processes and the capacity to satisfy customer expectations for efficient, quality service. TEC Equipment's President and CEO David A. Thompson opened Thompson Equipment Company in Portland, Ore., in 1976, originally buying and selling used trucks. Now, TEC Equipment is the largest multi-point dealership on the West Coast, with 1,300 employees serving customers in Washington, Oregon, Nevada, California and Arizona. TEC Equipment sells the entire range of Mack products and provides leasing, parts, service and body shop services. David Thompson's sons, David O., Chris and William, are the second generation to join the family business at TEC Equipment. TEC Equipment in Fontana is open 7 a.m. to midnight Monday through Friday, 8 a.m. to 4:30 p.m. Saturday and 8 a.m. to 4 p.m. Sunday.